CHOO. After yesterdays super feminine look I thought we needed something a bit more masculine for todays post to balance things out. So, here’s the second outfit I styled for my CHOO 24/7 Stylemakers collaboration. The inspiration behind this look was Helmut Newtons iconic pictures of Yves Saint Laurents Le Smoking for Vogue Paris in 1975, and the two protagonists in these shots are the Jimmy Choo ‘Charlize‘ clutch and the classic Anouk pumps! 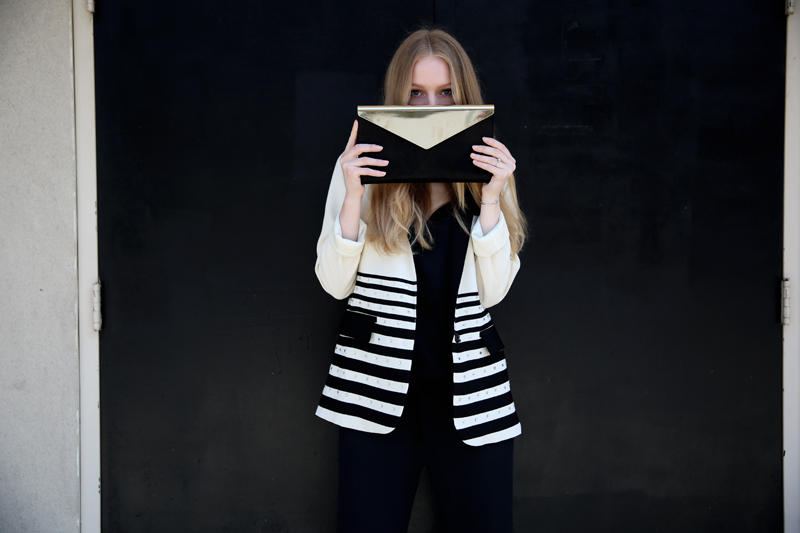 BLAZER Nanette Lepore. SILK JUMPSUIT L’autre Chose. CLUTCH Jimmy Choo ‘Charlize‘. EARRINGS Anton Heunis. CUFF Fashionsquad x Cooee. HEELS Jimmy Choo ‘Anouk‘. This entry was posted in Outfit and tagged anton heunis, choo 24:7, Jimmy Choo by Carolina Engman. Bookmark the permalink. Great black & white outfit! Can’t go wrong with Jimmy Choo.. love the clutch and the pumps! WOW! This outfit is just awesome! I love your hand bag!!! I couldn’t help but be reminded of Paris. Oh my! Anouk is gorgeous. Love the look. Tres chic. awesome pics!! I like that blazer a lot!!! It’s so elegant!! So beautiful with this smoking! Great inspiration! Looooove this look and fantastic clutch!!! Gorgeous!! That clutch is amazing! 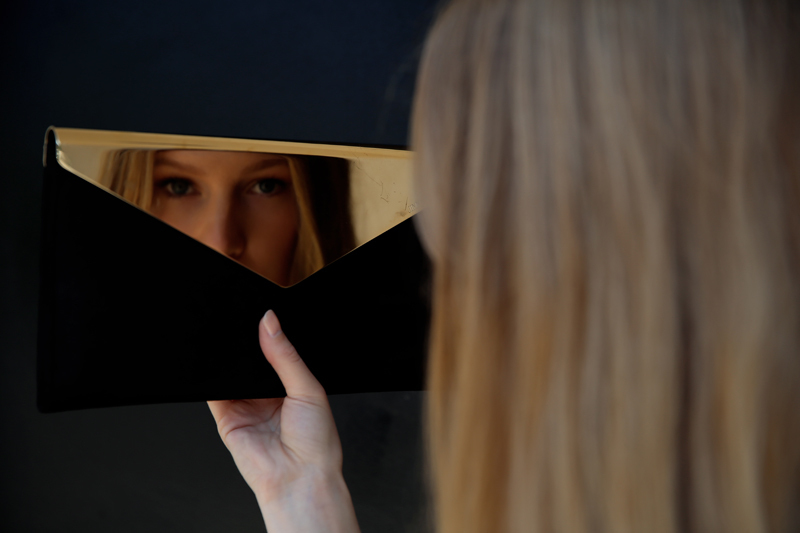 Wow, in love with your clutch! Clean look but I like it! Crazy cool Clutch! I love the YSL 60s reference, always refreshing to see that. I love the bag!! So pretty! Completely in love, as always <3 You look great!! Don’t miss today my Casual & Chic outfit…..including a Stunning Jumpsuit and my new Platform sandals!. Amazing Outfit, u Look Great. love the look, so classy. the pants fits great on you. this is such a strong look! Gorgeous heels and love. Love the inspiration. That monochrome striped blazer is pretty amazing too. Really nice and I like black and white combination. … I am thinking of Marlene, Greta and all the other beautiful ladies wearing suits. Unfortuneately today you are not getting a good and cool suit without spending thousands. Fabulous outfit Carolina, I adore the clutch! 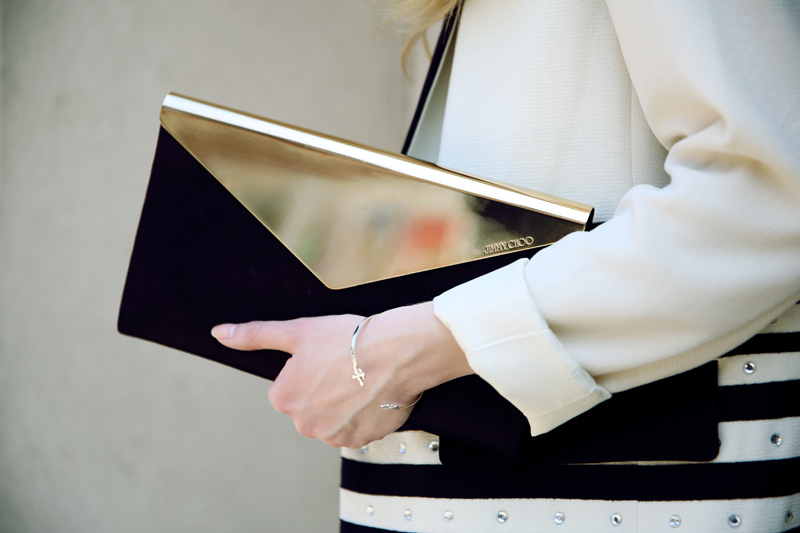 love your outfit, and the clutch looks so cool <3 love! Lovely -nice to see some more outfits posts from you in the last days. I love your blog! You look so elegant ! The suit and that clutch are great! Love it!! Fabulous outfit! I love your clutch! Gorgeous outfit! I love the blazer!! This jacket is amazing and I also love the clutch! I beleive that this look is amazing on you, so different from all the other looks you choose most of the times. You should propably start wearing pants, like jeans and baggy ones more often. that’s such an amazing clutch, i loooove it! loving this look. the clutch is simply divine! you might want to take a look at my post about jewelry and accessories? wow! I cannot believe my eyes! Jimmy Choo is definitely one of my fav! and this handbag is awesome! I could only dream about it..
LOVE the clutch! The shot of you mirrored in the bag is awesome! Love this professional & stylish look!! Your clutch is just gorgeous. I particularly like the length of the trousers, but overall it is a great outfit, and actually very inspiring!!! Very pretty outfit, once again! Oh gosh I love every single piece of this look! The shoes and the blazer are super cool! Loving this look, awesome clutch! Love this B/W look and how you paired it with gold accents, very classy!